Vinyl records are making a big comeback and that makes me feel happy. Not just because I kept my old turntable from years back. But because I see this movement as a sign that not everything technological is going to hell in a virtual hand basket. During the last few years technology has been on a roller-coaster ride, bombarding us, with so many of us now plugged in 24/7. Every trend, every movement hits its peak at some point. Perhaps modern technology already has. When that happens, the equilibrium needs to be adjusted to a more even keel. Vinyl records may just be what technology needs to get a grip, to maybe even (dare I say) slow us down. For the past few years musicians have been recording both CD and vinyl. That includes my son Martin and his band Beams. They have a 45 (yes, you read this correctly) with the required two songs – one each side – coming out this week. It’s not called a 45 anymore – but a seven-inch. For those of us old foggies with old 45’s, measure the diameter and then it will twig in. Did I say old foggies? The vinyl revolution is grabbing all ages – both for recording and buying. While I still have my really old Sears basic turntable (don’t laugh, but I have to physically place and remove the needle on and off the record) there are newer modern versions being manufactured with the built-in feature of converting to digital. The stats show that vinyl sales increased from 2013 by 71 per cent from 2013 in 2014 in Canada. That’s 400,000 pieces of vinyl sold. In the United States vinyl sales reached 9.2 million in 2014, an increase from 2013 of 51 per cent. But this vinyl movement might signal the way of the future, the answer – combining the old with the new. Think “radio.” Yes, radio; you know that audio device that’s been around for longer than me. Radio was the main way people found out quickly about events in World War II (The other modes around then, print news and film newscasts shown in movie theatres were not so up-to-date). When television became very popular, pundits said radio would die. It didn’t. I’m sure the same has been said about both radio and TV since the Internet got going and spawned more and more technology. Not true. Radio and television, while still operating on their own (somewhat. I’ll clarify that in a minute), are also connected to the Internet. You can watch TV programs online. Radio programs are broadcast online, often live-streamed. And there are online only radio and TV channels. For those of us who still like to watch our TV on an actual TV instead of online (the screen is larger for one thing), cable companies and the like offer program packages. There is also satellite TV. True, a lot of the broadcasting companies for radio and television have amalgamated. But there is also more diversity on what is broadcast with all news stations, all sports stations and my favourite, an all classic music radio station (96.3 Classic FM for those who want to know). Maybe this combination of old and new technology is the answer to the frenzied technological mess we are in. Maybe this is how the world gets back its technological equilibrium. And none too soon – before anyone else texting while crossing the street collides with a moving vehicle. Now, if only all other extremes in the world (like the weather) could find their happy medium. As we boomers escalate towards older and old age, what may help us live longer becomes a big concern. But is it all worth it? Lifestyle looms large as a positive factor. Studies show that if we eat healthy, exercise enough, don’t smoke, get enough sleep, avoid/manage stress, we can extend our life. Sounds good? Right? Not exactly. As with everything in living I have learned the hard way that there are mitigating circumstances. We might be able to control the no smoking, but the others? And why didn’t I include exercise in what we can control? Because many people have diseases, injuries that get in the way of enough exercise to help them. What about eating healthy? We can do this until the cows come home, but as we age, our bodies don’t absorb nutrients as well. Then there are the medical conditions, such as IBS, that make nutrient absorption even less. Getting enough sleep is a big issue with us older folk. I’ve covered this in detail before, but in a nutshell as we get older we find it more difficult to get the 7 to 8 hours sleep we need. Then there is stress – that is the biggie. Stress will directly or indirectly reduce life spans. How many heart attacks are caused by stress? How much sleep is lost because of stress? Stress is a catchall phrase. Actually there are stressors which cause the stress and stress which includes our reaction to the stressor attacking us. Experts talk about managing stress but I wonder if they are referring to the stressors or our reaction or both? I have learned that you cannot manage most stressors. Or should that be “control” stressors. My experience (and that of many people I know or read about) is that a large percentage of stressors come from what I call “outside.” That is, we don’t cause these stressors to well, happen to us. And despite what I have blogged about before, God is not responsible for a lot of our stress. Human stupidity and technological problems (for want of a better word) are. Let me give a few examples. If I dawdle around and don’t take care to be ready to leave on time for somewhere, so leave late and worry about arriving late, I’m causing the stressor. If I run into transit problems, that’s not my fault. No matter what time I leave I can hit transit delays. However, if I get myself ready so I leave early enough to allow for transit snafus, I can control the stressor/stress to a certain degree. Errors in utility bills, life insurance premiums, computer problems, continual missed garbage pickup (all of which I have experienced) are examples of human stupidity and/or technological problems causing stressors/stress. That’s scary. All the lifestyle changes to healthy won’t keep cancer way. I’m not saying to drink regularly until you pass out or smoke five packs of cigarettes a day and forget about exercising. I’m saying to live a healthy life but never take diet, exercise, sleep, etc. as lucky charms to keep cancer at bay. Won’t work. Personally I believe that if we could keep much of the stressors and resulting stress out of our lives we .could live happier more content lives. Not easy when most stress comes from outside. We can try to work around this stress. We can look at our over-busy lives and see what we can delete, delay or ignore. Be selective in what stressful situations you are going to tackle and what you can ignore or better yet, delete from your life. For example, last fall I evicted the horrible boarder living here. When someone pushes me on the subway (providing it is not towards the ledge), perhaps I can ignore that. The other stuff, the real crap in my life coming at me, I’m trying to deal with it one thing at a time, based on urgency and emergency – if possible. The rest go on hold, if only for a few days. And the hell with what the people causing the stressors think about it. It’s not easy. And I’m not sure I want to live into my 90s or even 80s – unless you are like actress Betty White. She just celebrated her 93rd and is going strong. How many seniors are like that? 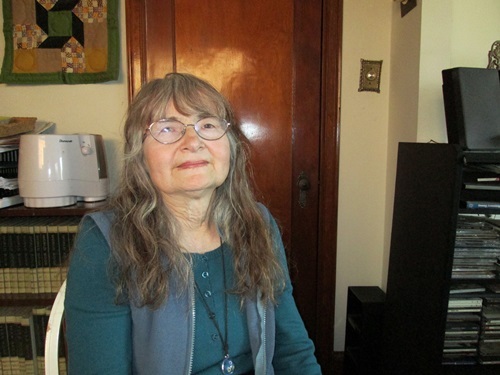 Not me and I’m still in my mid-60s and dealing with 10 health issues – those that I know of. Maybe the answer is to try to live your life as fully as you can now. What do you say? Comments please. I am trying to piece together my late father’s history – his ancestors and his life in Toronto before I came along. Not too easy when Dad was born in Montreal and the family moved to Toronto when he was a child. A year ago I began this quest – one of my cousins had started a trace on the Langevin (and Verey – the latter her direct family connection, not mine) ancestry on www.ancestry.ca. I’m not on there yet but one of my friends is and she offered to do some checking there. She found my cousin’s partial family history and also an anomaly – further digging by my friend found another last name (maiden one) for my paternal grandmother. Which is the correct one? I am not close to my Dad’s side of the family and it has been over five years since I talked to some of my cousins. But I emailed the family genealogist using an old email address. You guessed it – the email bounced back as no one at that address. However, life jumped in, including dealing with the horrible boarder living here last year, house and house-related problems, plus one pleasant thing – finishing rewriting my first mystery novel Beyond Blood (published fall 2014 – Warning: plug coming. See my publisher’s website www.bluedenimpress.com for more info and my other blog www.sharonacrawfordauthor.com). And found myself on a very enjoyable but puzzling journey. Picture me sitting at a table on the library’s second floor with Might Directories piled up in front of me. The shelves where they are stored are behind me, but I can only carry four books at a time. It is difficult with my health issues to get down to the floor to pick out the directories on the bottom shelf but I am compelled to do so. You are not allowed to photocopy the contents – not a copyright issue but the delicate nature of the pages. These are old directories, circa early 1900s (Dad was old enough to be my grandfather) and the pages are amazing. Almost like parchment with back to back pages which appear glued together. Back then, the “technology” did not allow for any other way to do this. The print is around the same size as print telephone directories, perhaps a smidgeon larger. With my bad eyes and old glasses I have to use a small magnifying glass to read the type. It is worth it – this going back and forth from the street listings to the name listing and I finally find my late grandfather. Thanks to my cousin’s information on ancestry.ca I now know his first name. But another Langevin surfaces in the Might Directories – a Charles Langevin and I have no idea where he fits in, except my grandfather and grandmother and their offspring lived with him for a few years. My grandfather (Eugene Langevin) shows up in the street address listing at some point and then in a later year, Charles has disappeared. Then my aunts and uncles and my dad show up living at the same addresses, including my cousin’s great grandfather (she is a cousin once removed to me). And it lists where they worked and the position they held. The listing criteria seems to be it didn’t matter if you were male or female as long as you held a job. I find my father not only worked as a clerk at Canadian National Railways but that previouslyhe worked with the Grand Trunk Railway before CNR gobbled it up. I finally find where his office was located – as I suspected right in Union Station in Toronto. One of his brothers, Uncle Paul also fought in World War 1, which I never knew. The directory has him still at the address but they classify him as “away on service.” And yes, he came back from the war. I also discover the Langevin family moved to Markham St. (where my cousins, their parents and my late maternal grandmother lived when I was a child) many years earlier than I suspected. Then I get carried away and start to trace my mom’s time from when she moved to Toronto from the family farm near Mildmay, Ontario. Not sure which year so I’m working back from 1938 the year before she and Dad married. 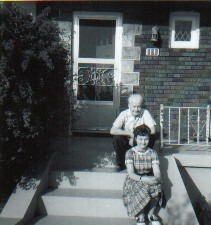 The address she lived at then (renting in a house) is in the area of Toronto where she and Dad lived when they were first married. Next investigation is to find out if the addresses are the same. An old photograph I have might give me the answer. I can see my memoir will need some changes. And I finally realized why I am compelled to do this family history investigation now. 2015 (November) is the 50th anniversary of Dad’s death. Looks like 2015 is turning into a repeat of 2014 (and 2013) – some just more of the same. I’m talking about the bad and the ugly. Yes, I did my overall overhaul of what I do, want to do and have to do and what I can kick out of my life. Trouble is the crap that comes at us “from outside” as I call it, the unexpected problems, are still charging at me (and I presume others) full force. You can’t really boot that out of your life. You have to deal with it and that wastes your time and causes a lot of stress. Yes (again) I did pray to God for certain things not to happen and for help. Cotton or wool in the ears I suppose at his end. Without going into a long detailed rant, the Rogers Cable TV service has started intermittent disruption – not just my TV service but at least Tanya and Alex’s next door. So far I’ve had three different technicians here. Despite my vocal (including one of those surveys) with my suggestion – fix all the damn old outside cables on the street, not piecemeal when something goes wrong, Rogers isn’t listening and the problems seem to persist. We had a big play out of this situation for over a month in late fall 2013. Rogers is to blame for this, but God is not listening to my asks for help once and for all here. The weather – that horrible mix on Saturday (and yes, some freezing rain, although worst in Montreal – despite my prayers on not having that happen – this time it was for more than just me). And now most of Canada is in the deep freeze and getting colder into tomorrow. So, I spent Sunday (before the deep freeze began overnight Sunday) running around doing errands so I could stay put for the most part this week. I had something important to get out in the regular mail (not something that could go by email) which needed weighing for postage, for my business, but being Sunday, presumably the Lord’s Day, Canada Post substations were not open – at least the post office part and one that showed up on the Canada Post locator map wasn’t there. The one near me had no signs inside or outside the store about the Post Office part being closed Sundays. Sunday closure is their prerogative, but they need to let the customer know with signs. I had to find out from the clerk at the regular cash and I was not polite to him when I found out. I sicced Canada Post on this substation. These and other things happening steal my time and make my health worse. And of course diminish my hope for 2015. But I’m not wallowing around in despair. There are thing I enjoy doing and want to do this year. So, I am facing the hard facts. When you get right down to it, you have only yourself to depend on – plus close family and friends you can trust. Or to paraphrase Ringo Starr’s song – you have to get by with some help from (family and) friends. Not God. “Ask and you shall receive” and “God helps those who help themselves” seem to be fairy tales. So, I need to forget about hope as such. Hope has now been added to my list of four-letter words which include pray, snow, rain, hell, crap, and damn. I have to remember my motto – when I see it (or not, as the case may be) then I will believe it.